Shimoga, officially renamed as Shivamogga is situated in the central part of Karnataka. It is known as the Rice Bowl of Karnataka. Shiva-mogga literally means the Face of Shiva. Shimoga is the gateway for the Western Ghats from Karnataka, and hence is aptly named 'Gateway to Malnad' or Malenaada hebbagilu. It lies on the banks of River Tunga. Shimoga is picture perfect with enchanting landscapes, waterfalls, hills, forests and beautifully swaying green paddy fields. Shimoga gains a place in the epic Ramayana as it is believed that Lord Rama slain Mareecha, who was in the guise of a deer, here. It was established by Keladi rulers in 1600 AD and was subsequently ruled by Kalyani Chalukyas, Kadambas, Rashtrakutas, and Vijayanagar kings. It remained a part of Kingdom of Mysore till India acquired Independence from the British. The two rivers Tunga and Badra flow through Shimoga and meet at Koodli to form river Tungabhadra, which later confluences with river Krishna. Winters (November-February) are the best time to visit Shimoga as the temperatures in summer can hit a peak of 40 degree Celsius. The rainy season lasts from June to October, as it lies in the tropical region. By Air:Shimoga Airport is still under construction. Mangalore airport, that is at a distance of 200 km from Shimoga is its closest airport. There are flights from Bangalore to Mangalore. You have to take a private taxi to get to Shimoga from Mangalore. By Train: The nearest railhead is at Tarikere. This is at a distance of 40 km from Shimoga. There are many trains chugging from Bangalore to Shimoga. The average time taken to reach is 5 h.
Route 1: Bangalore - Kunigal - Kadur - Bhadravati - Shimoga via NH 69. This takes 5h 13m to complete and runs over 284 km. Route 2: Bangalore -Tumkur - Hiriyur - Channagiri - Shimoga via NH 48. This covers a distance of 311 km and takes 5h 24m to reach. Route 3: Bangalore - Tumkur - Davanagere - Shimoga. This route passes via NH 48 and Shimoga- Harihar- Hospet Road, covering a distance of 351 km and in 5h 30m. Since the first route covers a considerably lesser distance, we recommend espousing Route 1. Prepare for an early start from Bangalore as you will be able to reach Shimoga by early afternoon. Also, you will be able to navigate easily across dicey vehicular movement. Kunigal is 70 km from Bangalore. It takes about 1h 15m to reach Kunigal from Bangalore. Kunigal, in the district of Tumkur is known for the stud farm incorporated by Hyder Ali and his son Tipu Sultan. Narasimha Temple of Kunigal is beautiful structure from the Hoysala period. It was altered heavily during the Vijayanagar period. It is said to contain a statuette of Janardhana brought from Huliyurdurga temple. You can also visit the Someshwara temple, Venkataramana temple and Padmeshvara temple. These are all ancient temples with the old world architecture in a fabulous display. Shivarameshwara Temple, however, is a fairly new temple dedicated to Lord Shiva. Hutridurga is a fortified hill, and can be entered from eight gates. It is also known as Doddabetta. This hill provides an amazing viewpoint, in addition to the temple of Shankareshwara. Markonahalli Dam is a beautiful place to visit in the evenings. It is built across the river Shimsha and is the biggest reservoir in Tumkur. Kunigal Kere/ Lake Kunigal is also an important and famous attraction in Kunigal. It has found its place in many folk songs of Kannada. Tiptur, which is on the way to Kadur is very famous for coconuts and copra (dry coconut). The entire region and its surroundings are involved in the commercial production of coconuts. Kadur is about 149 km from Kunigal. In approximately 2h 38m, you will reach Kadur. Kaduru is mainly an agrarian taluk. There are some industries here that are involved in the smelting of iron ore on a large scale. Dandigekallu Sri Ranganatha Swamy temple, Chennakeshava temple are some of the famous temples in Kadur. Sihineera Honda is a pond that has two temples dedicated to Lord Shiva and Anjaneya. Kuntihole is another name for river Vedavathi that flows in the region, cutting the rock bed at seven places. Keechakana Gudda is a cave temple which is very close to Kuntihole. Bhadravati is 49 km from Kadur and takes about an hour to reach. It is famous for Bhadra Wildlife Sanctuary. Apart from enjoying flora and fauna, you can also indulge in jeep safari, trekking, island camping, bird watching and rappelling. There are many temples in Bhadravati. The most beautiful of them being Lakshmi Narasimha temple, for its splendid Hoysala architecture. Bhadravati has two major industries viz., Visveswaraya Iron and Steel Plant factory and Mysore Paper Mills factory. These two factories contribute a lot to the city. Shimoga is 23 km away from Bhadravati. It takes around 30 minutes to reach.Here's a list of places that you can visit in Shimoga. This is now converted into a Government museum. Although named after the founder of Shimoga, Shivappa Nayaka belonging to the Keladi dynasty; this was in actuality built by Hyder Ali. The museum has many antiquities, sculptures, inscriptions from the Hoysala era. Dedicated to Lord Hanuman, Lord Rama and Goddess Sita, this is a temple that is believed to be from the Thretha Yuga. It is situated on the banks of river Tunga. This ‘S' shaped dam is constructed over river Tunga to provide irrigation to nearby villages and also to control flood situation. This makes for a lovely picnic spot, with sounds of birds chirping, and water gushing. This camp is a training and shelter place for elephants. It also has many captive elephants. The camp also has elephants visiting from the nearby forests for food and to splash in the backwaters. Sakkare Bylu is an ideal place to take the kids. This bird sanctuary is a lovely spot for bird watching. Gudavi sanctuary is built across Lake Gudavi. There are 217 species of flora and fauna. This place is a favourite for migratory birds and a lot of them visit for breeding during monsoon. Some of the birds spotted here are Indian Shag, Pariah Kite, Brahminy Kite, Junglefowl, Grey Heron, White Ibis, Black-headed Crane etc. This tiny village in Shimoga district is the only village in the country where almost all the residents have adopted Sanskrit as the medium of communication. This hamlet has a population of 5000 people and everyone speaks Sanskrit. Gamaka, the ancient art form of storytelling along with singing, is alive and performed in Mattur. This extremely famous waterfall is the second-highest plunge waterfall in India. 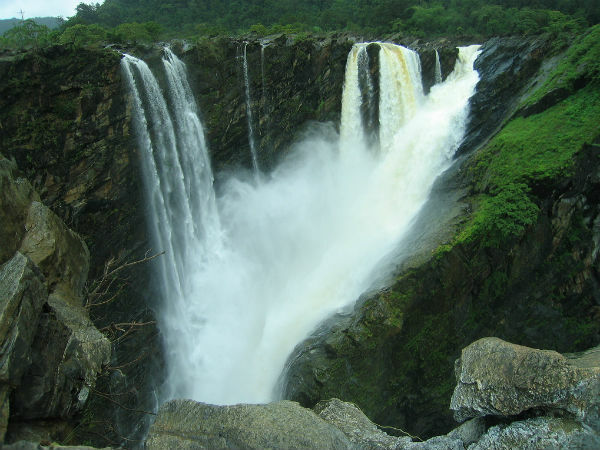 The drop height is 253 m. Jog Falls is perfect to visit during the monsoons when Raja, Rani, Rover and Rocket (names of the four falls) are in full force. There is a laser light show every evening from 7:00 pm to 9:00 pm. Don't forget to catch that elusive rainbow! This park organizes jeep safaris to watch tigers, lions, leopards, deer, sloth bear and many more. There is also a zoo enclosure and a children's park. This is a magnificent monument made from megalithic rocks. It is situated atop a small hill. Closely resembling the Stonehenge of England, this is a dedication to Kavi Kuvempu, a famous Kannada poet. There is also a memorial dedicated to him here.